Country Aircheck is a weekly online publication covering country music charting news. Each issue they have an off the record feature covering an artist or radio personality. Scotty is this week's feature. Enjoy! 19/Interscope/Mercury’s Scotty McCreery puts an industry spin on the artist interview. The first time I heard myself on the radio I had won Idol the day before and had to fly home to take an AP English exam. It was around midnight and we were driving through Garner heading to our house when 94.7 played my Idol finale single “I Love You This Big.” It was pretty wild to hear it on the radio for the first time and be with my family, in my hometown, after being in Hollywood for so many months. It was priceless. I’ll never forget the time we did a radio show concert at City Place in West Palm. We were with Sammy Cruise at WIRK. I think they were expecting 1,500 people, but the crowd was estimated at more than 8,000. The streets were packed and fans surrounded our bus. The police had to put me and my family in a cruiser and take us out the back way. There’s no place like home, but I love Boston... Quincy Market, Red Sox, Boston Harbor. My dad grew up north of there in southern Maine. The whole area is just beautiful. If I don’t have my cell phone when I travel, I go insane. Gotta stay connected to my friends back home and my Twitter family. The last purchase I made from Skymall was, well... I've never actually bought one, but those Big Foot statues look pretty cool. I'd love to stick one in my backyard and surprise my dad. He loves all those Big Foot documentaries. When there’s downtime you’ll find me playing Tiger Woods PGA Golf. 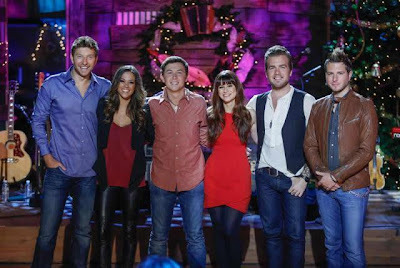 Scotty McCreery is already in the holiday spirit thanks to a recently released Christmas album and yesterday he gathered friends Gloriana, Jana Kramer and Brett Eldredge to tape Christmas With Scotty McCreery & Friends, a holiday special premiering Saturday, December 1 at 11p|10c on GAC.